FME excels at indelible first impressions. Not only is that a credit to the confidence of the organizers of the festival, their knowledge that they have a world-class event in a wonderful setting, but it's a testament to the pride of the local population as well. Music, food, art, beer, culture, and staggering northern scenery combine over the course of Labor Day weekend to create an experience like none other. Remembering the music you experience is a given. The key, though, is the fondness one develops for the region after spending four days there. When a common refrain among visitors is, “Why don't we live here?" the event cannot be called anything but a rousing success. You arrive unsure what to expect, and you leave a few days later, your breath taken away. The first time yours truly was invited to travel to Northern Quebec to attend the Festival de musique émergente en Abitibi-Témiscamingue, that “sense of the unknown" was tantalizing. An “emerging music" festival in the mining town of Rouyn-Noranda, population 41,000? An annual attendance of 24,000 people seeing the finest in independent and experimental music? Practically in the middle of nowhere, an eight-hour drive north of Montreal, with a tiny airport and a whole lot of boreal forest and Canadian shield surrounding it. Where do all these people come from? The air is unseasonably crisp, the sky overcast but non-threatening on Thursday 31 August. The water of pretty Osisko Lake, which Rouyn-Noranda wraps around, is a gleaming deep blue as early attendees, most of them school age, make their way to 7th street, where two blocks have been cordoned off to serve as the festival's hub. 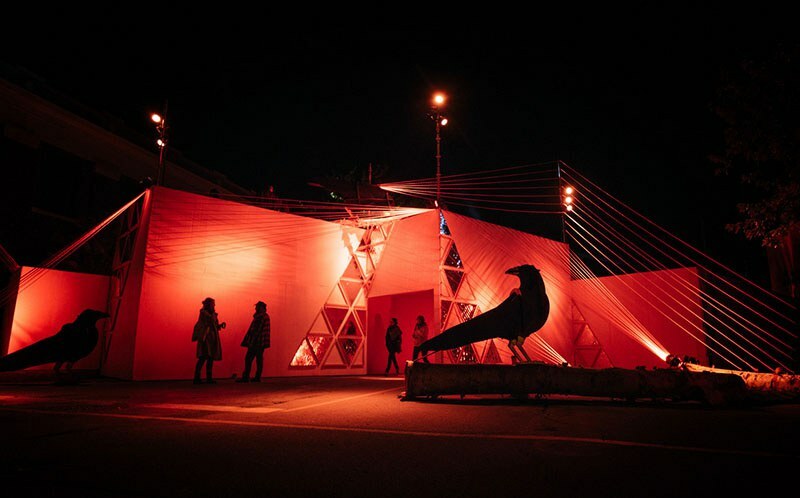 There to greet them at the corner of 7th and Murdoch are a pair of wooden crow sculptures, sentries in front of an elaborate red and black structure built from wood and wire, serving both as an immersive art piece and also an entrance to the festival area. 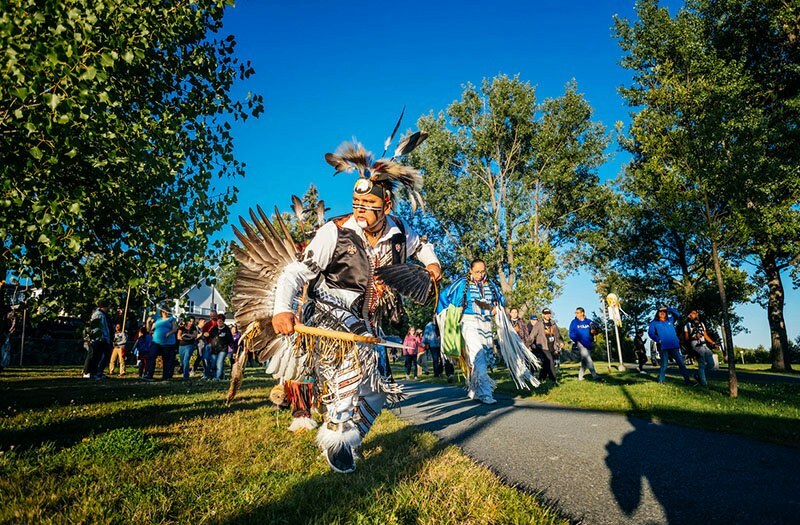 Under the guidance of artistic director Karine Berthiaume, the installation fittingly reflects the aboriginal theme of this year's FME, as the weekend will go on to prove. Hours later, as the sun sets, a more adult crowd comes out to see the night's diverse performances. Across the street from the wooden crows and their elaborate gate stands the Agora des Arts, a church converted into an arts center, a typical example of increasingly secular Quebec shedding its ultra-Catholic past. Inside, local artist Philippe B plays to an adoring hometown audience, his introspective francophone singer-songwriter fare holding the seated crowd enraptured. Following his charming, understated set, fittingly enough, is Andy Shauf, the current poster boy of charming, understated Canadian indie pop. Still riding the wave of critical acclaim, late-night TV performances, and rising popularity on the heels of 2016's revelatory album The Party, Shauf is in full command during his hour-long set, his pristine arrangements and soft-spoken singing perfectly suited to this gorgeous little venue. It's the sort of setting where you can hear a pin drop, everyone hanging on every word sung by Shauf, every note played, every gently caressed drum brush. Back outside on 7th, at the main outdoor stage, rising Québecois artist Nadia Essadiqi, better known as La Bronze performs her sultry, R&B-infused Franco-pop, followed by Congolese-Canadian singer/musician Pierre Kwenders and his sumptuous blend of hip hop and African influences. The experimental electropop feel of the new material lends a decidedly European flavor to the night, and everyone is dancing, from fashionably dressed young adults in their 20s, to families with young children in strollers, to elderly couples strolling the grounds hand in hand. Barbecue pork is being roasted on a spit, its smoke whetting taste buds, while Québecois beer Boréale is everywhere, poured into cute red and black reusable mugs, which locals carry around attached to their backpacks with carabiners. 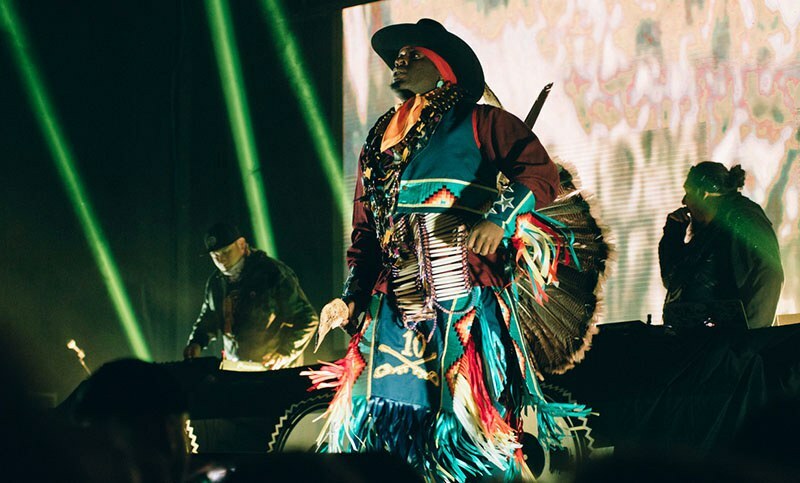 The opening night comes to a sensational climax with renowned Canadian act A Tribe Called Red, whose blend of First Nations music, EDM, and activism ignites the entire street, the block immediately turning into a euphoric dance party in the chilly early autumn air. Riding the critical acclaim of the Polaris Prize-shortlisted 2016 album We Are the Halluci Nation, the trio is quickly becoming one of Canada's most popular electronic acts, and as empowering as the music is for anyone with Native North American roots, it is still welcoming and inclusive, as the multi-racial crowd danced up a storm as DJ NDN, 2oolman, and Bear Witness pulled off an inspired mix of their own beats and Paul Revere and the Raiders' “Indian Reservation", stealing a piece of 1970s kitsch and making it their own. Once you get into the rhythm of FME over the course of the weekend, it becomes a joyous blur of concerts, pop-up performances, art installations, food, drink, and of course the charming hospitality of the locals. 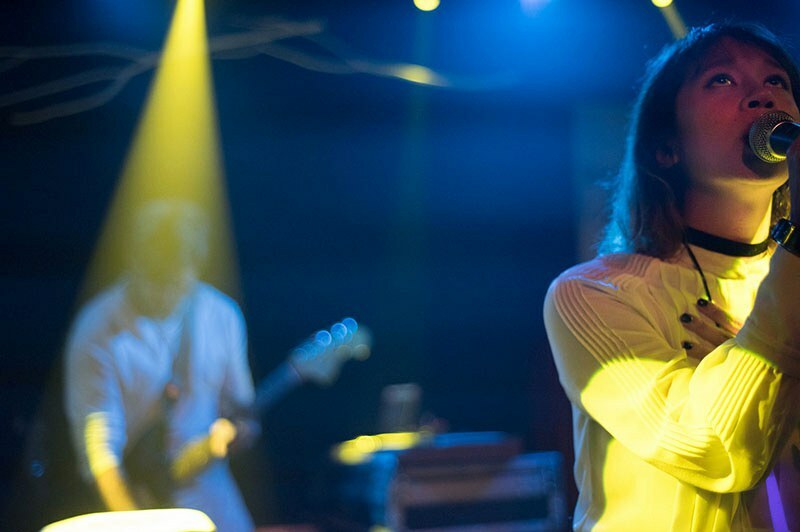 Led by singer Annie-Claude Deschênes, maniacal Montreal art-pop band Duchess Says play a raucous set at one in the morning, following it up ten hours later at a wine-soaked industry pool party on the lakeshore. Brooklyn multi-instrumentalist Emily Wells charms a packed house with her experimental indie-pop, while Montreal's Elephant Stone churns out vintage psychedelic rock that taps into frontman Rishi Dhir's Indian heritage. Performers from the local Anicinabe First Nation stage a music, dance, and storytelling performance that only heightens the festival's irresistible sense of inclusion. 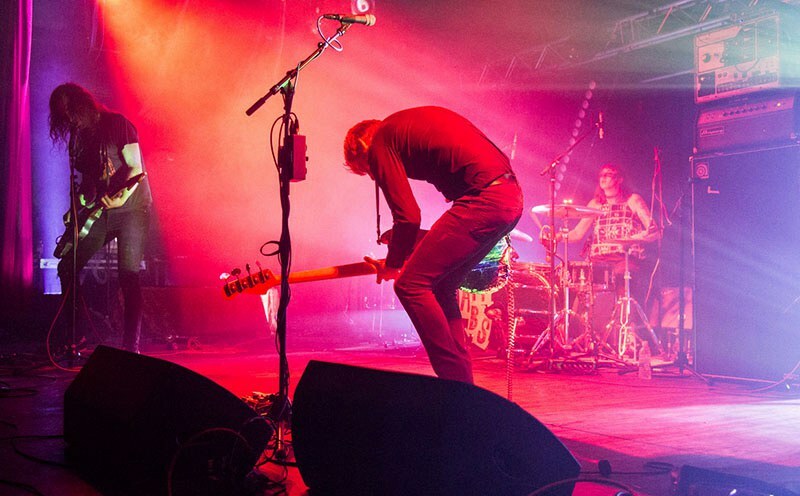 Noise rock mainstays A Place to Bury Strangers lay waste to the Petit Théâtre du Vieux Noranda with a loud, violent, cathartic performance. Sunday night is an experience in extreme contrasts: hundreds crowd the Petit Théâtre to see death metal veterans Incantation and Swedish black metal innovators Marduk cartoonishly defile, blaspheme, and headbang to an adoring throng, while across town a large, much mellower crowd witnesses a rousing tribute to local folk music legend Richard Desjardins. Meanwhile, the festival's biggest discovery is Le Couleur, who crank out a lush-sounding set in the cozy Scène Évolu-Son. By combining Francophone electropop with vintage Italo-disco (along with touches of Air and St. Etienne) the European influence is unmistakable, lending a cosmopolitan air to this remote Northern community. The charming performance, featuring singer Laurence Giroux-Do, is enough to send yours truly, among others in attendance, scurrying to their brilliant 2016 album P.O.P., be it at the merch table or on Spotify. With the stature of FME growing every year, the influx of visitors has inspired the Abitibi-Temiscamingue region to step up tourism efforts. A fine example is La Cité de l'Or, located an hour's drive east in the neighboring city of Val d'Or. Based at the now-defunct Lamaque gold mine, visitors are offered an immersive experience, donning coveralls and helmet lamps, and travelling 300 feet into one of the dozens of mine shafts that tunnel deep into the bedrock. It's an extraordinary experience, not only learning firsthand what the miners of the 1940s had to experience, but the overwhelming sensory challenges, from the cool air, to the humidity, to the staggering darkness. Surrounded by the quaint local neighbourhood of Bourlamaque, a collection of log cabins that formerly housed miners and are now protected as heritage properties, it's a surreal little world to visit, an enriching education in the Quebec Gold Rush. For such a small city with a working class reputation, the food in Rouyn-Noranda is sensational and often surprisingly adventurous. During summer Avenue Principale in central Rouyn is abuzz with restaurant patios. Le Cachottier serves tapas with a strong Québécois influence and locally sourced ingredients, while next door Le Trèfle Noir is a superb brew pub run by the locally-run craft brewery of the same name. Bar Le Groove is another cozy tapas place that attracts younger clientele, and Pizzédélic offers first-rate Italian fare. For those interested in a more blue-collar experience, gigantic bottles of Molson Export, bowls of popcorn, and Francophone karaoke sing-alongs at Bar Des Chums offers old-school Quebec flavor. Slightly cooler is the friendly La Diable Rond across the street, an old-timey pool hall that doubles as a killer music venue. Of course, a Quebec experience would be incomplete without poutine, and if you've never tried French Fries, gravy, and cheese curds late at night, then Chez Morasse is an absolute must for post-midnight cravings. Having attended music festivals worldwide, I have never seen anything like FME, where cutting-edge music and art is celebrated by an entire community, not just a select pocket of people. It's one thing for an industrial town to shift its focus on the arts once its non-renewable industry dies (in this case, copper) but it is absolutely remarkable to see the general public embrace the idea with so much enthusiasm. It is, bar none, the best music festival this writer has ever seen in Canada, and although it takes an effort to get to, it is worth the journey, a marvel of open-mindedness in the heart of mining country.